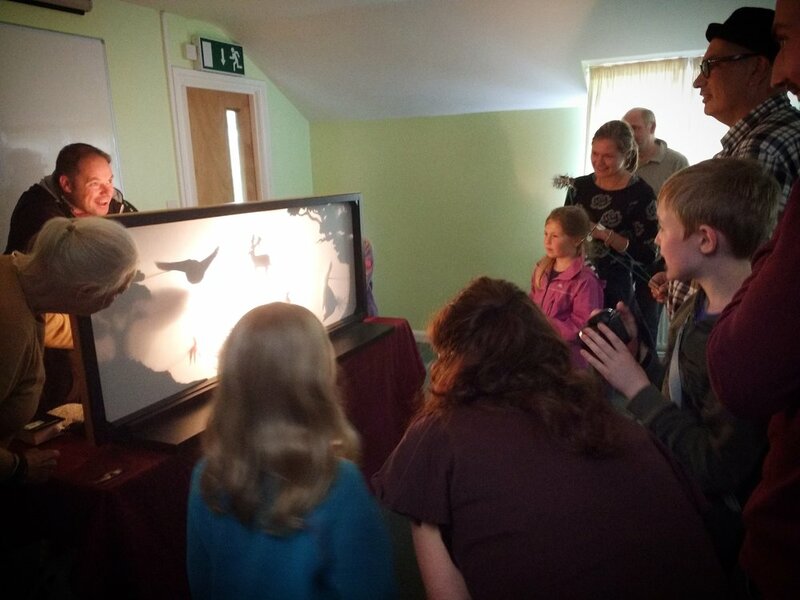 We are excited about combining live action with shadow puppets, for a collaborative performance tomorrow with Totnes Young People's Theatre. This devised piece tells a tale of a ship wreck and mermaids seeking revenge for humans' pollution of the seas. Even the dolphins are angry ..."and it takes a lot to annoy a dolphin!" The wood Fair was great fun, young and old enjoyed creating a woodland scene together, bringing it alive with their charming shadow puppets. One family decided to throw out their TV and get a shadow puppet stage instead! Twin boys celebrated their 6th birthday with friends on 8th July, by creating their own scary monsters and mythical creatures shadow puppets. As a grand finale to this Lightbulb Fantastic workshop, the children performed a story, devised themselves, to their proud and delighted families. "Great afternoon - very varied activities; designing, making, story, performance. Very different from usual party stuff" Neil Davenport. "Fantastic experience, variety of activities, learning new skills and working as part of a team. Great idea for a party. Evelyn loved all the colours and making. Highly recommended." Dave Glassock. Join us for some Christmas Magic on Saturday 17th December at the lovely Jellyfish Gallery in Buckfastleigh, Devon. All ages are welcome (under 11s need an adult with them) and the workshop runs from 3 - 6pm. £10 per puppet, which you can take home.